RoboMBE™ is a powerful software package that gives the user the ability to automate and control the various hardware components of a semiconductor growth system. Using RoboMBE, the user can ensure run-to-run reproducibility by monitoring and adjusting growth parameters. This software automates repetitive tasks such as ramping of temperature profiles and sequencing of source shutters. RoboMBE runs on a standard Windows PC providing a graphical user interface with all instruments of the growth system. RoboMBE's interface allows for convenient programming of shutter, gas flow and temperature recipes. 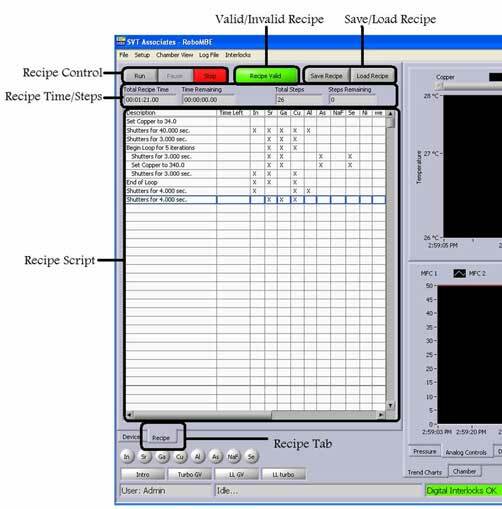 Data logging of instrument parameters is included for quality control or statistical analysis.